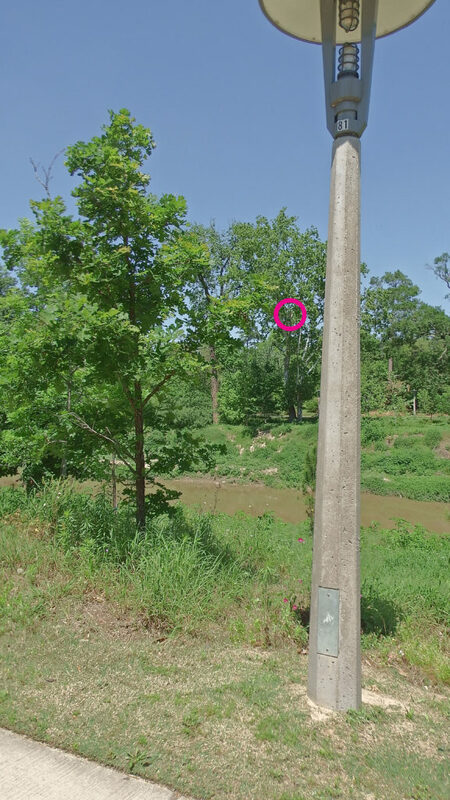 Not a long post this week, but I want to let you know how to find the red-shouldered hawk nest. I have found two spots from which you can see the nest and I will be checking out a third when I get a moment. 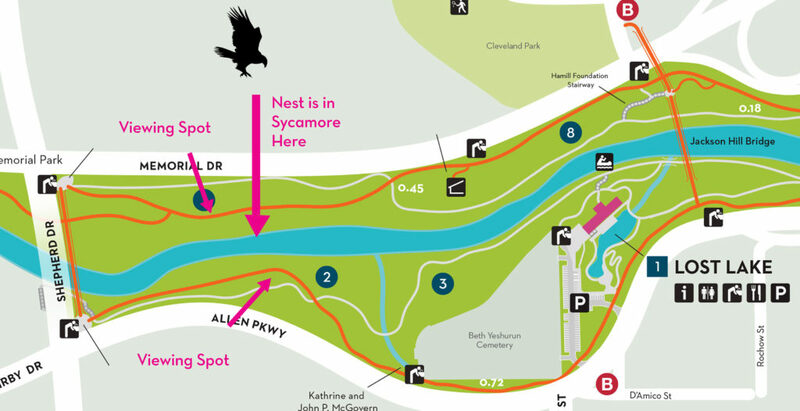 The nest is in a large sycamore on the north side of the bayou just east of the intersection of the two trails shown in the map above. Sycamores are those large trees with the white trunks. The nest is in a crotch 2/3 of the way up the trunk of the tree. The best viewing spot right now is on the north side of the bayou. Every time I have visited, the hawk is facing northwest, so from this viewing spot, you can see her head. Stand at the x and look up and to the right for the best view. You will need binoculars to see anything in detail. This is the hawk nest seen from the north side viewing spot. 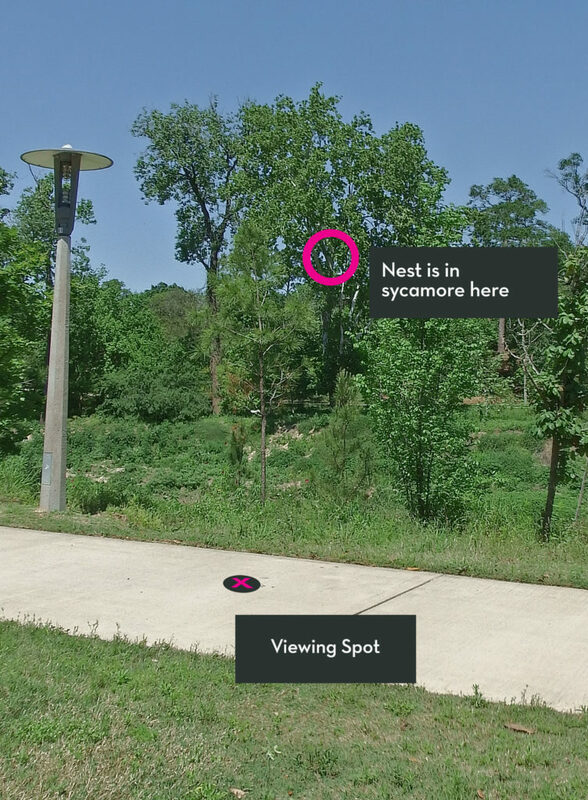 There is also a viewing spot on the south side of the bayou. I used this spot to check on the hawks when they were refurbishing the nest, but they waited for the sycamore to leaf out before laying eggs. All those leaves make it very difficult to find the nest from the south side of the bayou and when you do find it, you may not find the hawk within it because her head is usually facing northwest and all you see is her back which looks a whole lot like the nest itself. That’s how I managed to miss her last week from my usual spot. 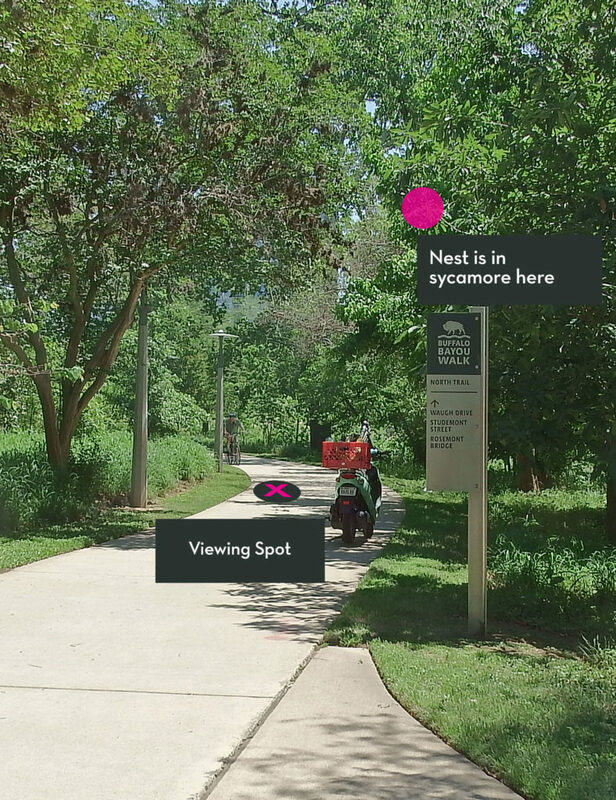 Nest is in red circle. 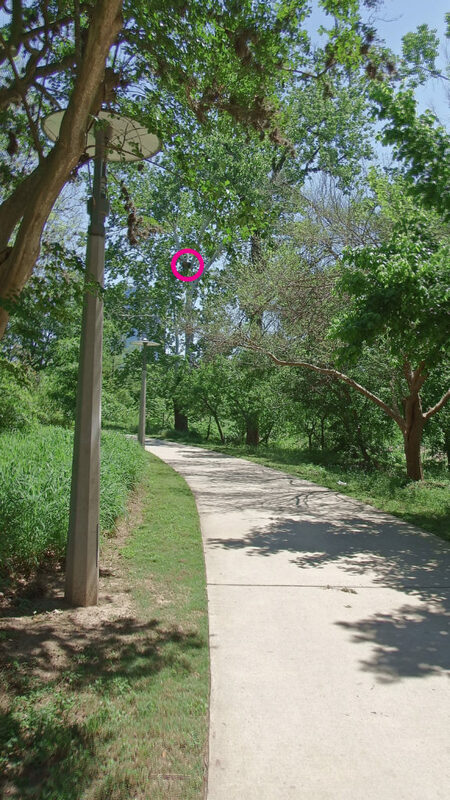 This lamppost is a good marker if you are trying to find the nest from the south side of the bayou. My best guess is that the eggs will hatch in about two weeks. I have my eye on a possible third viewing site. More next week when family life calms down.